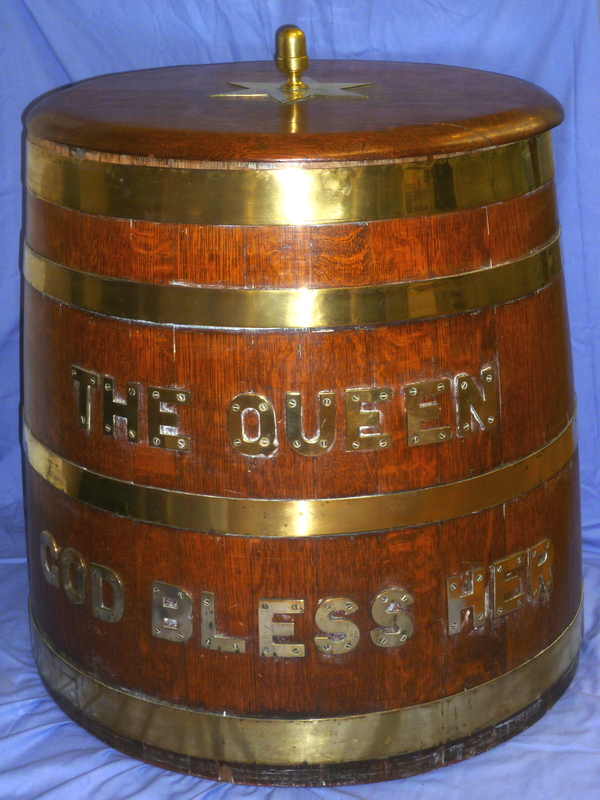 In our collection is a Royal Navy rum barrel. Made of stout oak and one of our heaviest items, it took four strong people to manhandle it into the Maritime Heritage Centre when it was donated in January 2016 by Mr Peter Rowe, who bought it at auction in 1971. It was in store and awaiting the commission of a new Royal Navy warship in 1970 when it was decided to discontinue the centuries-old tradition of issuing a daily tot to seamen. For hundreds of years Royal Navy seamen queued up in galleys all over the world, wherever they were in service, to receive their regulation lunch-time tot of rum. However, on 31st July 1970, known in the navy as “Black Tot Day”, the last rum ration was given out. Black armbands were worn as the Queen was toasted. (Our barrel is emblazoned with brass letters reading “The Queen God Bless Her”) Tots were buried at sea and at one navy training camp sailors paraded a black coffin flanked by drummers and a piper. The Admiralty took away the tot because of concern a lunch-time dram of strong spirits would impair sailors’ ability to operate increasingly complex weapons systems and navigational tools. The £300,000 annual saving (1970 value) was put into providing shipboard bars for petty officers and an amenities fund for ratings. The daily ration then was 1/8th pint (70ml) at midday, diluted with water for junior ratings, neat for senior. Prior to the early 18th century sailors had relied on beer as a beverage but on long voyages the huge volume of beer needed - 1 gallon per seaman per day-and its tendency to go sour in warmer climates as the British Empire expanded meant that when Jamaica was captured from Spain in 1650, the navy changed to rum: a daily ration of neat rum, half a pint twice daily, at about 60% proof! By 1740 Admiral Edward Vernon was so concerned by what he described as the “pernicious custom” that he ordered the rum to be diluted with citrus juice. Lemons and limes as well as the rum were freely available from the West Indies. This had the additional advantage of helping to prevent scurvy owing to the vitamin C content. The watered down rum was, however, derogatively called “grog” by sailors after Vernon’s nickname of Old Grogram, because of his liking for wearing a cloak of the material, a coarse fabric of silk, mohair and wool stiffened with glue/gum. It would be wrong to suggest the Royal Navy relied on crews of drunken sailors, but of course drunkenness did occur, even though it was punishable by flogging with the dreaded “cat’o’nine tails” well into the 19th century. For a fascinating account of the uses, abuses and effects of “grog”, consult our reference library, for Roy and Lesley Adkins’ book “Jack Tar”, the extraordinary lives of ordinary seamen in Nelson’s navy. A “tankie”, a long-serving able seaman, AB, on light duties had the daily task of going with the duty officer to withdraw as much rum as was needed for the entire ship’s crew from the Rum Store. Water was added to the barrel, and at 11.50 there was a tannoy announcement: “Up Spirits” At 12 noon each man went to his own individual mess. Each mess had a “Rum Bosun”, who had collected from the duty officer a measure for each man in his mess in a type of metal kettle known as a “Rum Fanny”. Anyone under 20 now had to leave the mess; Jim had to wait until 1962 to be old enough to be allowed his rum. Traditionally the first sip was a toast, “To the Queen, God Bless Her”. If a shipmate was owed a small favour, his friend would let him have a sip; but for a larger favour, he had a “gulper” (though this was illegal) For a huge favour, he might down the whole tot as well as his own, but this was very rare. The rum had to be drunk there and then, as a social occasion. When all the messes had been served their entitlement, the “tankie” was supposed to throw any remaining rum and water mixture. If any remained in the Rum Fanny, it was called “The Queen’s” and shared out in the mess. Very, very occasionally, the captain might authorise an extra tot to men who had been on duty in appalling weather and were frozen cold, almost like a medicinal aid to warm them up.